View the Print-Ready Ad Specs >. Want to make changes to an existing ad? Contact us prior to issue deadline. With enough advance notice, we are able to send you a proof of your revised ad prior to publication. Include business name in subject line. The Shopper’s Guide office, located on the corner of Route 23 and West Avenue in Great Barrington, is open Monday-Friday for you to walk in and place an ad, or drop off your ad, artwork and/or copy. 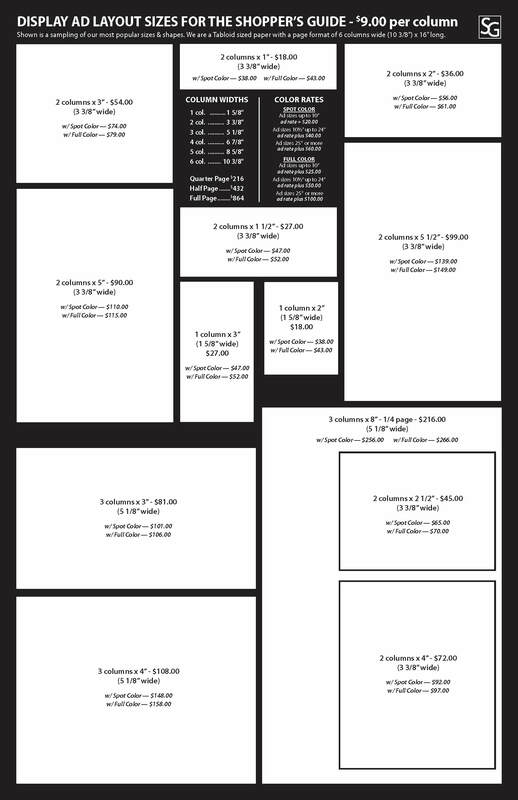 When an ad composed by the Shopper’s Guide’s Art Department is cancelled before the first insertion, there will be a $4.00 per column inch charge. Until credit is established, advertisers must pay for the space at the time of insertion. Want to get your insert out to 20,000+ readers of the Shopper’s Guide? Call us at 413-528-0095 for more information. Shopper’s Guide offers a lively mix of display and classified advertising, much of which is grouped for easy reading and quick referral. Animals, Antiques & Auctions, Arts & Entertainment, Camps, Dining, Efficient Living, Heath & Fitness, Help Wanted, Home Improvement, Lawn & Garden, Real Estate, Tag Sales are among the sections offered. We do not charge for routine and composition. There is an additional charge for camera ready ads prepared for use in other publications. Proofs will be provided when requested – but changes will only be made in the event of typographical errors. There is no charge for requested position, nor is it guaranteed. The Shopper’s Guide will make every effort to comply with position requests. Originals (photos, logos, artwork, etc.) will be held for 30 days after which time we will no longer be responsible for them. All advertising is subject to approval. The Publisher reserves the right to reject any advertising copy at any time, and acceptance of copy or prepayment does not imply agreement to publish. The Shopper’s Guide assumes no financial responsibility for typographical errors in advertisements, but will reprint the portion of the advertisement in error at no cost. Neither is responsibility assumed for more than one incorrect insertion of the same ad.